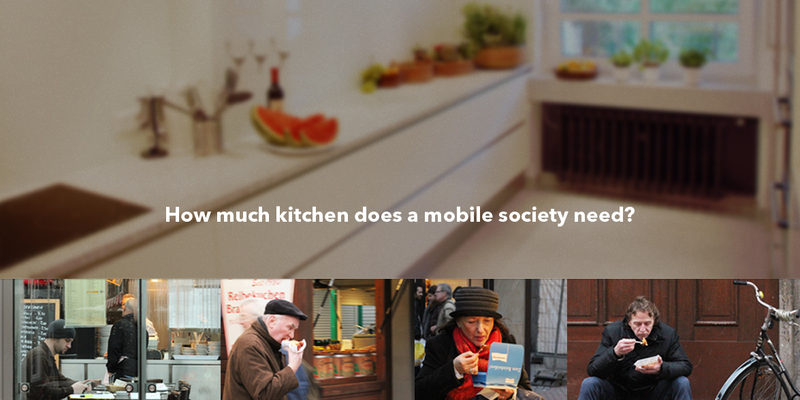 In a mobile society, eating out is becoming increasingly popular. As an alternative to a traditional, fully equipped kitchen, the SCHNITTSTELLE was specifically designed for the needs of mobile urbanites. 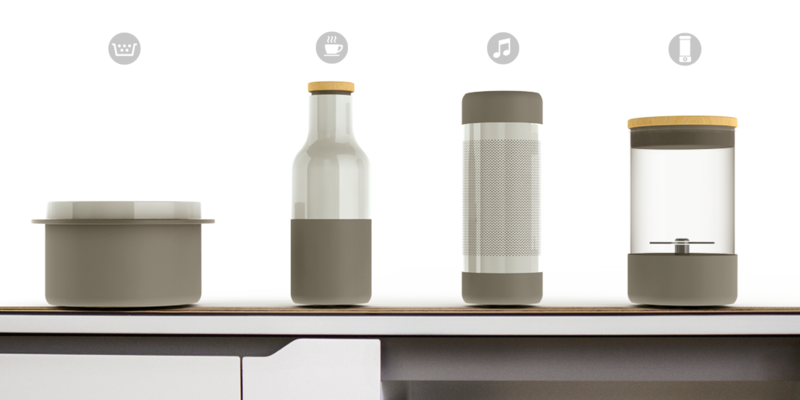 This compact piece of home furniture can also be integrated in small residential units, and in doing so offers kitchen functions “on demand”. Copper coils with different resistances beneath the wooden surface can be used for inductive cooking, wireless charging, but also for operating electronic devices such as mixers or loudspeakers. This saves redundancies in control electronics and displays of different devices, and compiles these in an adaptive interface. 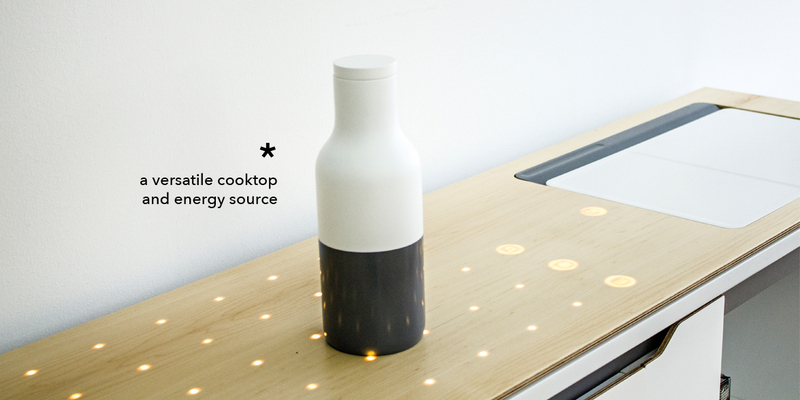 As a veritable slim kitchen, the SCHNITTSTELLE puts the most energy-consuming location in the household on a diet. 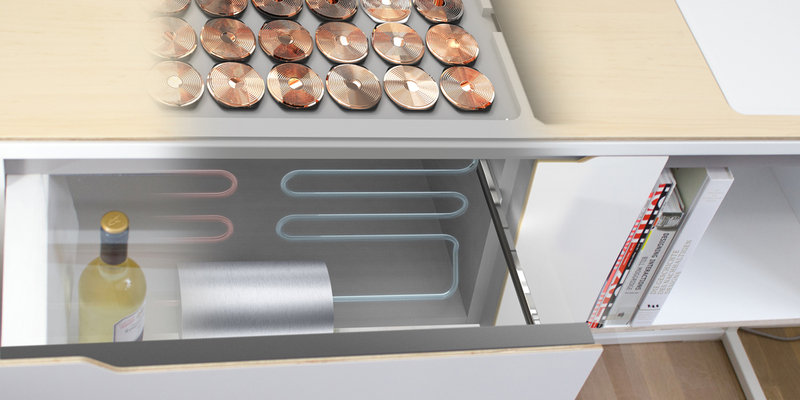 The induction field as well as the integrated cooling drawer reduce energy consumption. The around 40 litres of cooling volume are cooled magnetocalorically. The innovative cooling method does not require toxic coolants or a compressor – and consumes around 35 percent less energy than the most modern compressor refrigerators. The starting point of the concept was the examination of the rapidly changing values in our society reflected in our cooking and food habits. Today already, we are faced with a paradox when it comes to kitchens: they are becoming increasingly larger and better equipped; organic foods and urban farming are trend of the hour, cooking shows and their actors the latest stars. Current studies show that the number of single-person households is rapidly increasing. The living space in major cities is diminishing. Eating out is booming in the mobile society. There’s not much cooking going on at home. We are returning to the stove – yet only from time to time, and only as a hobby. The desire for company is increasingly not satisfied in our own four walls, but in third places: from co-working spaces to co-cooking spaces. What and how much remains of the kitchen in our homes if the tendency towards decentralised living is constantly growing? Nowadays, kitchens are the rooms that consume the most energy in a household. Besides the refrigerator, it is above all the countless electronic devices waiting in standby mode on the countertop for their use while consuming idle current which has a negative impact on the energy balance of a kitchen. The objective of this draft was to reduce the functionality to that which is actually required and thus reduce the space and resources needed in a kitchen. The SCHNITTSTELLE works with electromagnetic energy transmission. Copper coils with different resistances beneath the wooden surface can be used for inductive cooking, wireless charging of mobile phones or tablets, but also for operating electronic devices such as mixers or loudspeakers. This saves redundancies in control electronics and displays of different devices, and compiles these in an adaptive interface. 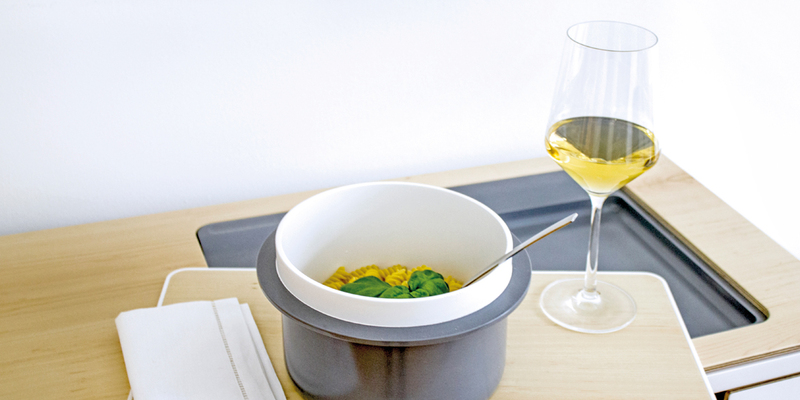 In this context, the intuitive operating concept offers the highest user convenience. The desired function is easily and conveniently available as soon as a device is placed on the surface, thanks to the integrated device identification. As comfortable as in standby mode, but without any annoying cables and above all without consuming idle current.